Low back pain patients are not a homogeneous group, but unfortunately they are often times treated like one. There is an overwhelming amount of causes of pain (disc, ligaments, facet joint capsules, muscle strain/spasm, stress fracture, etc.) and possible diagnosis for low back pain. However, research has shown that the specific “diagnosis” of low back pain rarely correlates with the cause. Imaging studies have shown that there are tons of people walking around with an asymptomatic disc herniation, so even if your patient has an MRI with a L4-L5 disc herniation it might not be the driving cause of their pain and dysfunction. If an effective treatment is preceded by an accurate diagnosis, then we can see why so many healthcare professionals have a difficult time getting their LBP patients better. To deal with this conundrum a treatment-based classification system was developed to allow for interventions based on a continuous assessment instead of a one-time diagnosis. Over the years it has become more refined and detailed, but the core concepts are the same. The overall concept is to assess which of the 3 categories (manipulation, stabilization, and specific exercise) your patient falls into and treat accordingly within that category. Below is a chart with the 4 categories and associated possible examination findings and treatment interventions. There are more than 3 categories described here, but the other categories are either subcategories or irrelevant. Specific exercise category has 3 subcategories (flexion, extension, and lateral shift). And I personally do not consider traction a valid category to consider. 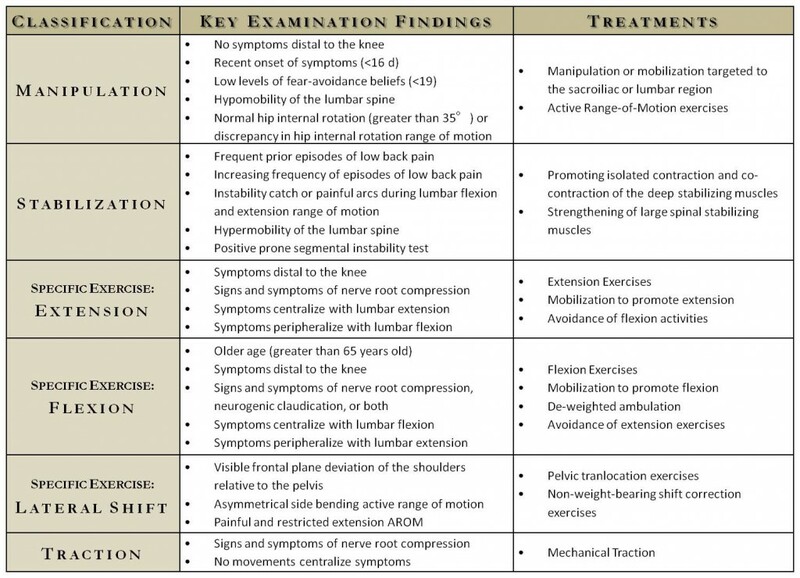 Treatment-Based Classification System for Low Back Pain. Click on image to enlarge. A patient comes in with low back pain that has been insidiously increasing over the past few months and can’t pinpoint any event that caused the on-set of pain. They prefer a sitting posture, sleeping on their side with their hips and knees flexed, and have increased pain when standing. During AROM assessment the patient states that the pain increases when testing lumbar extension and the pain decreases with lumbar flexion. What category would you place this patient in? Pretty obvious, right? While placing this patient in a flexion based intervention category, it is important to keep in mind that you need to always assess and re-assess throughout the plan of care. Of course this is not a method that is intended to be dogmatic. This is a simplification process used to help classify a difficult patient population for an effective treatment. It gives healthcare professionals a logical and methodical means of how to begin low back patients rehab. Assessing before, during, and after interventions will always help to ensure that your patient is on the right path to recovery.